I have two titles currently. 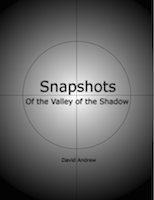 Snapshots: Of the Valley of the Shadow, published in 2008, is a thematic collection focusing on life transitions. 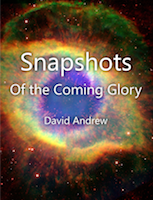 Snapshots: Of the Coming Glory, compiled in 2010, is my reflections on the Glory of God. Each book can be found on Smashwords via the link next to each cover or online through the respective stores geared for your e-reader (iBookstore, Kindle store, et cetera). Both books are also available in physical print! If you enjoy these works, please consider donating to support my work! Free on Smashwords and iTunes and the Kindle Store! Also available in physical print!